The most famous of all ceramicists? Most certainly. But there is more to it. He remains a great name in French history for having been a model of perseverance and a passionate searcher and artist who burnt his furniture in order to reach the necessary temperature to fire his ceramics : a scene immortalized for generations in French school books and narrated by Palissy himself in his “Discours admirables”. 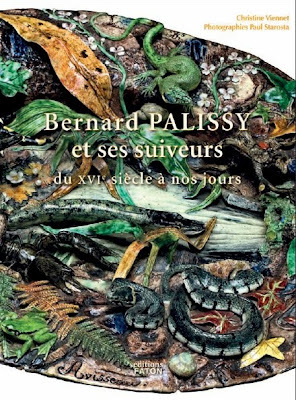 It is first of all, this strong and creative personality that captured Christine Viennet’s interest and the reason of her studies of Palissy. His tribute to nature, his enthusiasm and curiosity, led to the invention of his naturalistic ceramic style and has marked ceramic history. In her book, Christine Viennet shows a thorough knowledge of the works of this multitalented man and of his followers from the XVIth century to the present days, with 300 pictures of a stunning collection of plates, vases, ewers… and notably fine pieces from the XVIth to the XXIst century. Ordering a copy of the book is as simple as visiting the MIS Bookstore.